I can not thank you enough for helping me move on such short notice! I’ve told at least a dozen people how fabulous your team of movers (Chip, Dave, Nick) were, how professional, fast, and friendly. My friends are moving next month and I’ve given them Big Foot’s number with a glowing recommendation. Your flexibility on payment options really blew me away and I so appreciate it! Your commercial storage, distribution, and installation requirements are met by the many years of experience of our relocation consultant team, our well trained warehouse staff and our modern facility. Whether you have office furniture, store fixtures, displays, trade show exhibits, hotel furnishings, new products, machinery, or electronics, Big Foot Moving & Storage, Inc. can design a complete program to fit your storage, distribution, and installation needs. Your equipment or products are carefully inventoried, placed on racks, or containerized for safe keeping until called for. All employees are skilled professionals which are reliable, trustworthy, courteous, athletic, attentive to your needs, and able to ensure the safe delivery of your possessions to their new destination. A central location totaling over 25,000 sq. ft.
Big Foot Moving & Storage, Inc. provides a diversified array of delivery capabilities to efficiently handle your items. Large capacity – Big Foot Moving & Storage, Inc is a Penske Rental Truck agency which allows us to increase our fleet as needed. Trucks, tractors, trailers of all shapes and sizes can be utilized at a moment’s notice. 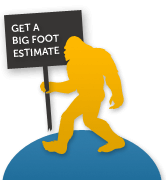 Big Foot Moving & Storage, Inc. has the people, facilities, equipment, and experience to handle any of your commercial storage requirements. From one pallet to multiple trailer loads we can also arrange for the convenient shipping and transport of almost anything to or from almost anywhere at competitive rates. Please call us at 781-488-3090 or contact us for a rate quote on any storage, shipping and receiving, or distribution needs you may have.